This skin is just the Google Chrome skin with a few replaced images and the rest desaturated so it matches more closely to the Dust theme in Ubuntu 8.10 Intrepid Ibex. Updated checkboxes with those used in Google Chrome and applied desaturation. Desaturated radio buttons that were already there. Desaturated bookmark buttons that were already there. Updated checkboxes with those used in the Dust theme instead of regular Google Chrome checkboxes. Updated radio buttons to those used in the Dust theme. Updated the scrollbar to match scrollbars found in the Dust theme. Updated icons and other various images with those found in the Opera 10 Alpha standard skin. Updated icons were mostly for composing html email, however there were a few other new ones. Fixed a bug that was introduced with Opera 10 Alpha 1 and the Chrome style tabs. Cleaned up appearance of tabs and new tab icon on pagebar. Cleaned up skin.ini code a little. Updated group_closed.png and group_open.png to match similar icons found in the Dust theme. Officially titled this skin as “Dusty Chrome”. Replaced pagebar.png background image with one that I worked on a short while back (last year for v1.06 of Standard Dust 😉 ) so that the skin matches the latest release of the Dust theme’s title bar color scheme. I will work a little more in the future to perfect it even more. Set “Fallback foreground = 1” and “Fallback background = 1” after being contacted by Opera about them cleaning up and improving their skin selection. 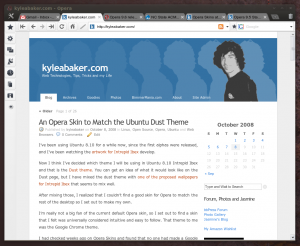 Retouched the scrollbars and pagebar background to match the ones found in the Ubuntu 9.04 Dust theme. But on Windows, I’ve noticed a very thick address bar and spacing between buttons are weird on the right side of them. Keep up the good work, we may see something really smooth in the following versions. I just tried this…being using the native windows skin for ages. Hi Kyle, thanks so much for sharing. This skin is wonderful. 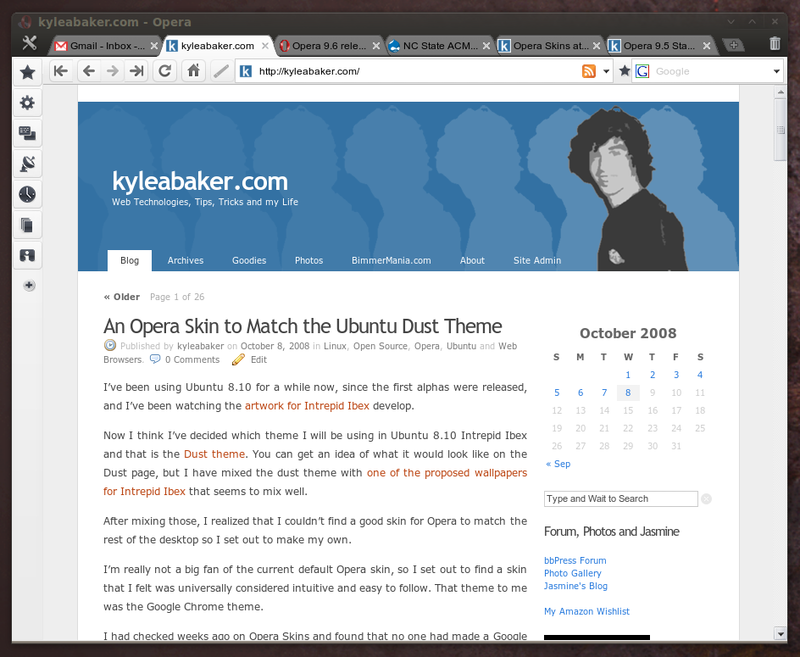 skin on the opera browser.